This is the time in the Fourth Degree when we relax and enjoy the comfort of home and friends, as we remember the past year. 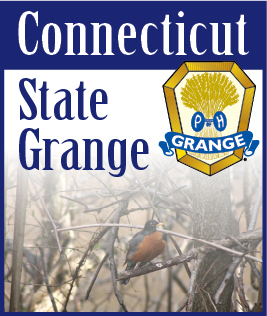 We in the Connecticut State Grange have done a lot. We reorganized the Pomona Granges from seven to three. They are working on by-laws and will be meeting to begin anew. We have closed three Community Granges, and are in the process of selling three Grange halls, returned to the State Grange. A new format at the State Session did draw more member involvement, but the lack of resolutions and candidates has brought worries to the State Master. The passing of Past State Master Ellsworth (Bud) Beecher has brought many memories back to me. When he was State Master he got me involved in the State Grange family as his Director of the Agricultural Committee, while my father was Director of the Legislative Committee at the same time. Brother Bud also installed me as Master of East Central Pomona #3 the first time. I practiced the Obligation for months and when it was time Brother Bud just recited it and never asked me if I knew it, what a letdown. Brother Bud’s love of the Camp always stands in my mind and if we got rid of the Camp we would be destroying his child. I remember the time at State Session banquets or Junior Grangers that called him Uncle Buddy, and the fact he couldn’t sing always makes you chuckle. Good bye Uncle Buddy to the Great Grange above. This year many Granges will have to make the decision of whether to stay or close. It is time for us to regroup and decide. The State Grange Membership Committee has funds and experience in helping your Grange with a Membership drive. CALL THEM FOR HELP!! That’s the only way we can assist you get new members. New Pomona Granges need to involve every Pomona member in these new Pomona Granges to make them successful, LET’S WORK TOGETHER!! And make it work. Now is the time to write resolutions for next State Session. Many things are happening in this Nation that will have some effect on you and your community. The Grange is founded on our “Grassroots Efforts” and can have great influence on local, state and national issues. The pen is mightier than the sword. We can change the world with one piece of paper. Take the time to write resolutions that will have positive a positive impact on the world.